Extremely easy to fit on the car seat, covered the whole seat so baby was never wet nor was the material on the car seat, clear plastic so enable me to see my daughter vice versa. best fits and you do have to know the knack to get it on especially as it can wrinkle and slide up a little. Overall a handy purchase and definitely well worth having. This is such a great invention. We are always out with the car seat and it’s so easy and simple to use and you will be surprised how many times you’ll need it. Excellent must have for a car seat. Ideal for when using car seat on pushchair Nd also ideal if your just nipping out and is raining. Easy to use used on both maxi cosi and a silver Cross car seat and fit perfect. A must have for car seat. Does the job well, keeps baby dry. Would be better if it folded a little better. Definitely worth purchasing. It fits nicely over the car seat and it protects very well against rain and wind. I find it difficult to nearly fold it to store and because of that it wrinkles the plastic quite badly. Overall I would recommend it as I have not found any cover that stores nicely folded yet. This cover is easy to store and fairly easy to use once you get the hang of it. I do consider this product a must have for parents it's a life saver not just when it's raining but in windy weather too. It can be a little tricky to put on the first few time or in a hurry but once you know how it's easy. Working perfectly!! It’s very easy to use and covers the car seat in full!! Cost wise it’s cheaper than most other rain covers. Really recommend. Can get creased up and look a bit messy! This is a lovely rain cover. Its quite sturdy and where others have ripped, this one has stood the test of time. Its simple to fit over car seat, but can get creased if its crumpled up for a while. This is a great little rain cover, does exactly what’s it’s meant to do and keeps rain off baby. The cover is also lightweight so you can take it out and about just in case it’s needed! This product is easy to use and appears to fit on most car seats, good clear plastic that doesn’t restrict the view. Decent pricing as well. I’ve only used mine a handful of times but it stores away in th car without taking up so much room. 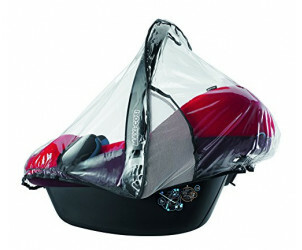 This raincover was very easy to use with our cabriofix car seat. It has breathable side so you know your baby is safe. Used the same car seat for 3 children.. and still going strong. The car seat has been washed loads of times and colour still hasn't faded.. it's brilliant and easy to use on a buggy also. Definitely recommend and would 100% buy again. Sometimes struggles to cover car seat in a rush due to a snug fitting. I used this on my maxi cosi pebble and it fitted perfectly! Convenient having space to securely hold the handle. Very good quality and looks very nice on car seat. This was an amazing product for my daughter when she was a baby all I had to do was pop it onto her car seat and I knew she was dry I could still carry her easily through the handle hole at the top and it covered her from the wind and rain. Great raincover easy to put in and take off, handy little gap for handle to carry and stores neatly in the little flap at the back of car seat so less chance of forgetting. Fab little Rain cover quick and easy to put on in a hurry fab for smaller babies not sure how it will hold up with older baby however. This product is really simple and easy to use, it is super stretchy and covers car seat perfectly. It folds up really small for storage. Keep your little one dry and cozy with this Maxi-Cosi car seat raincover when carrying them in their car seat in bad weather with this handy raincover, designed for use with the Maxi Cosi Pebble, Pebble Plus and Cabriofix (sold separately).